Popularity is no protection against budget cuts: The parts of government that Americans like the most — state, cities and counties, and the U.S. Postal Service — are also the ones shedding workers the fastest. The most recent nonfarm payroll figures from the Bureau of Labor Statistics show that the public sector continues to be a drag on overall employment. Governments at all levels have shed 835,300 jobs since public-sector employment peaked in April 2009 (not counting the spike in early 2010 caused by temporary Census workers). The private sector, meanwhile, has regained 6.78 million jobs since bottoming out in February 2010, and over the past year has averaged 180,500 new jobs a month. 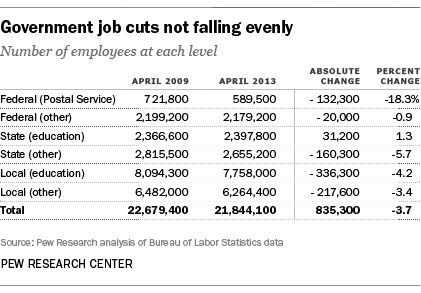 But the government-sector job cuts haven’t been spread evenly. In terms of sheer numbers, local schools have lost the most: 336,300 jobs over the past four years. Other local government cutbacks have eliminated 217,600 jobs; states (except for public colleges and universities) are down 160,300 jobs. 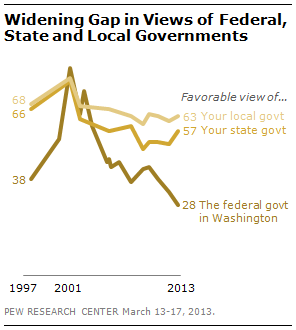 In a Pew Research Center survey conducted in March, 63% of people said they had a favorable opinion of their local government, a level that’s stayed fairly constant over several years; 57% expressed favorable views of their state government, a five-point uptick from last year. But just 28% rated the federal government favorably, versus 65% unfavorably; the favorability rating was five points lower than a year earlier and the lowest ever in a Pew Research Center survey. Notwithstanding the dim view most people take of the federal government, and despite the wide-ranging budget cuts known as “sequestration,” most of the federal payroll remains intact. Leaving aside one big exception, there were 20,000 fewer federal employees last month than there were four years earlier, a decline of less than 1%. The exception is the long-suffering Postal Service, where employment is down by 132,300 jobs, or 18.3%, since April 2009. The Postal Service has been shedding workers for years, though the pace picked up during the recession; it accounts for 15.8% of all government job cuts since April 2009, even though it employed only 3.2% of the total government workforce. Even so, the Postal Service is one of the better-regarded arms of the federal government. In a 2010 Pew Research survey, 83% of people said they had a favorable opinion of the Postal Service, the highest level among the 13 agencies asked about. More recently, 60% of respondents in an NBC News/Wall Street Journal poll said they had “very” (28%) or “somewhat” (32%) positive feelings toward the Postal Service — more than President Obama, either major party, the Catholic Church or the NRA. The one government sector that’s actually added jobs has been state education, which is up 31,200 jobs (or 1.3%) since April 2009. Although many state legislatures have reduced funding for public colleges and universities over that time, tuition bills have risen sharply to compensate.